I have another Native War Paints polish to share with you today. I will say after trying my second polish from the brand I can 100% confirm that Native War Paints is the absolute queen of shimmers. I heard angels singing when I put on this polish and I still think I hear some. This is one of those "it" polishes that will be forever revered in my nail polish collection. 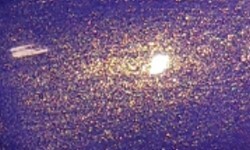 Sweater Dress is a royal purple with an intense golden shimmer. Color: Do you hear the angels too? Look at this polish! It is heavenly. I love this purple shade, but that shimmer? It is the best shimmer I've ever seen in nail polish, hands down. The end. This is the absolute best. Formula: Excellent formula. It was easy to apply and I used 2 coats. Price: This is $8.50 on Native War Paint's site. Overall: Go click the link above and buy this polish now. You needed it yesterday. I'm sad I didn't get it when it was released last year because it would of been on my Top 25 of 2015 list for sure. This is an insanely beautiful polish. This is an absolute must have!